Each month I will describe sights of interest in the night skies of South Carolina. These sights will be broken down into three sections; what you can see with the naked eye, with binoculars, and with a small telescope. The best time to view the night sky is at and around the times when the Moon is not visible, what is known as a New Moon; which will occur this month on July 2nd. For July, your best viewing nights will be from July1st through July 7th, and July 24th through July 31st. The Star chart below is set for Florence, SC on July 15th at 9 pm. The summer sky has arrived, and many interesting objects are in the south, along the Milky Way. However, this month there is an interesting event occurring in the western sky. Normally, this time of year the constellation Leo is not a target of interest since it is rapidly setting, and will be totally gone by months end, but there is a “Dance of the Planets” occurring in Leo. Beginning on July 1st, Mars will be right above the bright star Regulus in Leo; use binoculars to see the sharp contrast of colors, white star/red planet. From July 1st on, Mars rapidly moves toward Saturn, and on the night of July 10th, Mars will be very close to Saturn, generating another interesting binocular object and color contrast; red planet/yellow planet. This event is a good news/bad news situation. The bad news is that Leo and especially the two planets will be low in the western sky, setting soon after 10 pm. The good news is that with many amateur binoculars and telescopes, bright planets are much easier to see clearly in twilight skies than when sharply contrasted in dark skies. So, the best approach is to start observing the planets from about 9 pm, until they move down into the horizon’s haze. One more planetary note: Venus will become the “evening star” this autumn. If you have a clear horizon in the west, you just might get an early view of Venus right near the horizon just after sunset late in the month. Now let us return to the south, and we have a bright “visitor” this summer, the planet Jupiter in Sagittarius. Its location is shown in the last image below. Jupiter will slowly rise in the southern sky all through July and August. Next month I will spend more time discussing Jupiter. On any given summer, the southern sky is filled with wonderful sights. 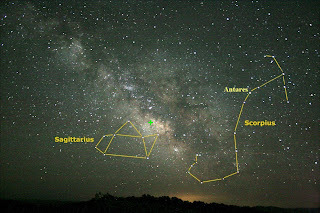 First we mark off this region with the two constellations, Sagittarius and Scorpius, shown in the image below. 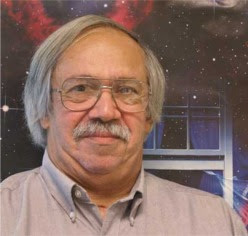 This image is from a dark sky site, and there are several such sites in the United States, far away from cities, where you can see the sky as shown here. Scorpius is one of the few constellations that looks like its namesake. Scorpius with its “J” shape looks like a scorpion complete with claws, a stinger and a red/orange star for heart (Antares). Scorpius is the correct spelling of the constellation and not Scorpio the zodiac sign. To the left of Scorpius is the constellation Sagittarius the archer. Very few people see this constellation as an archer; however, most people see it as the “Teapot asterism” with the handle on the left, the spout on the right, and the triangular lid on top. In addition to these two constellations, the most prominent feature in this photo is the beautiful Milky Way. In the summer, the southern sky view is toward the center of our Milky Way. The green “+” sign above the spout of the teapot marks the exact center of our spiral galaxy. Near this green “+” sign, astronomers have detected a strong X-ray source known as Sagittarius A* (pronounced A star). It is believed that Sagittarius A* is a Black Hole in the center of our galaxy. So what do you do on a nice summer evening? You don’t need a dark sky site as shown below, just point your binoculars or a small telescope in the region above Sagittarius and also over toward the stinger of Scorpius and you will see beautiful fields of stars. 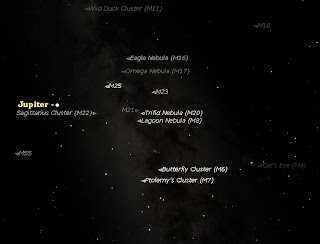 Try slowly scanning this region first without any charts or plans, and you will find many objects that you know must be star clusters or nebulas. Later you can consult star charts to identify some of the objects you discovered in this region. The following image shows 14 Messier objects in this region and the location of the planet Jupiter, but there is much more to see in this area with only binoculars or a small telescope (can you see Sagittarius and Scorpius in the image?). Say goodbye to Leo as it sets in the west, but take time to observe Mars as it quickly moves from the star Regulus on July 1st to nearly touch Saturn on July 10th. Try to spot Venus right after sunset toward the end of the month. Locate Scorpius and Sagittarius. Also notice that Cygnus that set in the west last November is now moving up from the East to directly overhead (zenith). Spend most of your time this month scanning the regions above and to the right of Sagittarius. See how many Messier objects you can find. Target of the month: the planets Mars and Saturn as they nearly touch on July 10th.